The Appropriate Technology Collaborative Thank You - 2012 Was a Great Year! Thank You - 2012 Was a Great Year! 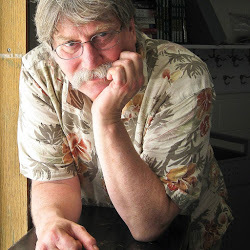 2012 was a banner year for The Appropriate Technology Collaborative. Our products, technologies and programs reached more people in 2012, we brought more volunteers to work with our clients and started new innovative projects that will continue to be an important part of our mission from here forward. 1. In January ATC friend Juan Carlos Cheves helped us transport a complete solar power system from the U.S. to the CECAP School on Lake Atitlan in Guatemala. This was no simple task, shipping involved ocean freight, warehouses, import into Guatemala, ground transportation, water taxis and a truck ride up a very steep mountain road. 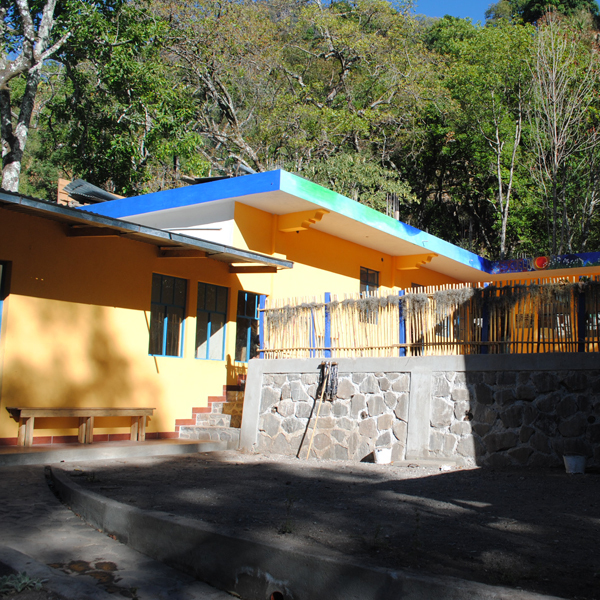 Good Work to Juan Carlos and the Rotary Club of Guatemala Sur! 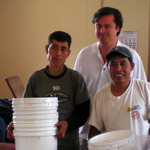 Photo: Juan Carlos Cheves with water filters. 2. In February we had our largest single group, 17 in all, travel to Guatemala to join 10 Guatemalans to install solar power on the CECAP school and to fix up a Parvolos School in San Marcos. With such a large group we were able to work on 5 projects. Surveys from participants both Guatemalan and U.S. show 100% would recommend ATC volunteer travel to their friends. Thank you Rotary International! Photo: Volunteer travel team March 2012, CECAP school roof. 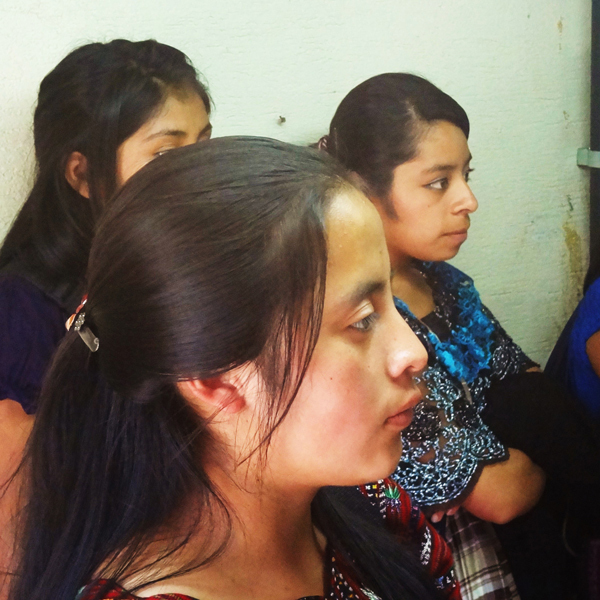 Mayan Power and Light will teach Mayan girls about electricity, circuits and solar power. In summer 2013 The Appropriate Technology Collaborative will help them start a solar power cooperative. For this very disenfranchised population education + opportunity = a higher standard of living and healthier families. Opportunity with ATC creates a multi-generational improvement in quality of life. 3. In February and March on the lake in Guatemala we gathered data for new volunteer projects, including designing solar power for a small school in the village of Tzununa on Lake Atitlan, which is now scheduled for March 2013. 4. We continued work with the University of Michigan BLUELab Woven Wind team. This is an exceptional group of students who have traveled to Guatemala twice so far to work with local women weavers to create a wind turbine that can be manufactured in part from locally woven fabric. 5. January – March ATC’s amazing and inspirational educator Michael Smith along with Jose Ordonez, Carlos Alvarez and Santos Pelechú created the popular curriculum “Circuits and Solar” which covers electricity, circuits and solar power. The curriculum is used to teach technical school students the skills to work for, or to start, a small scale solar power business. 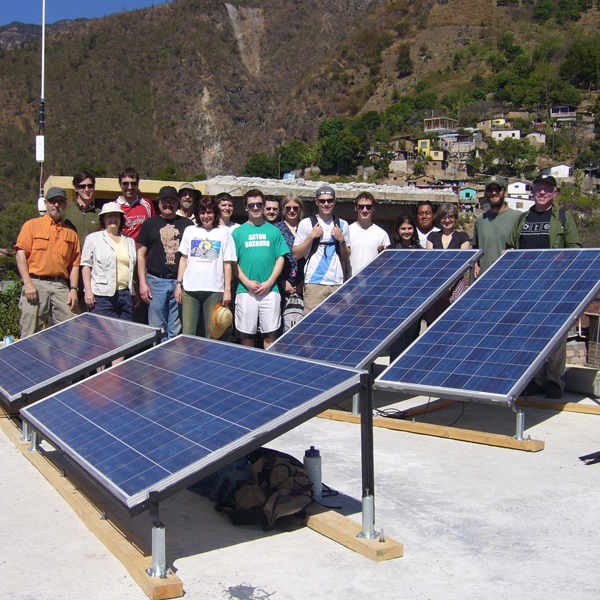 In 2012 Circuits and Solar was a big hit in Guatemala and in the U.S. Thank you IEEE Foundation and the Clif Bar Foundation. More to come in 2013! 6. 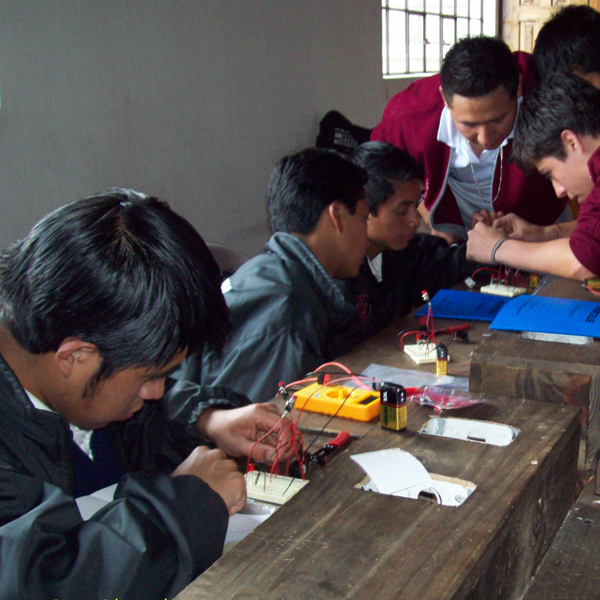 In March we taught “Circuits and Solar” at the CECAP school in Guatemala. Our teaching method is to work with experienced Engineers and Teachers in the country where we hold a workshop. Guatemalans teach Guatemalans and Kenyans teach Kenyans. This works much better than “us” teaching “them”. ATC is about collaboration. 7. In March ATC’s Ruben Mata and wife Kayla welcomed son #2 Robin into the world. Ruben has taken on greater responsibility for ATC projects. 8. 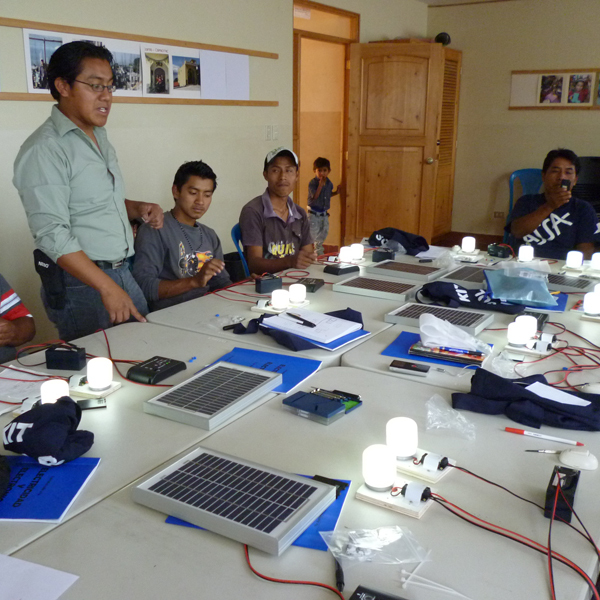 In April we taught “Circuits and Solar” at the Asturias Academy in Quetzaltenango, Guatemala. Carlos Alvarez and Jose Ordonez were the teachers. At both schools there is now a waiting list for future Circuits and Solar classes. 9. 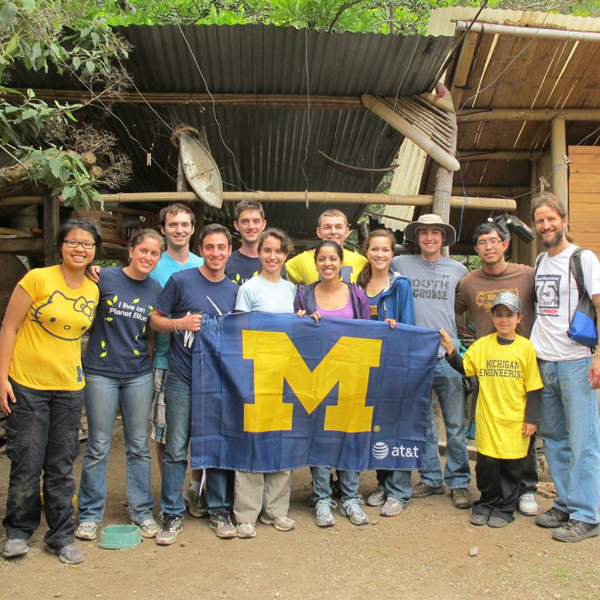 In May University of Michigan Woven Wind returned to Guatemala to produce a new version of their woven wind turbine. In just one week Woven Wind met with the women weavers, discussed the design, built a second generation prototype, proved that it worked and visited Mayan Ruins at Iximche. 10. ATC delivered 12 high definition “Flip” video cameras to Foto Kids, a nonprofit that teaches photography skills to kids who grew up picking through garbage at the Guatemala City Dump. In their 20 year history Foto Kids has grown into a photo, video, graphics and website development company that teaches and employs kids from the dump. Some of the original Foto Kids are working there today as teachers and multi media producers. Check out this short video they produced for ATC – Video Link. 11. We started a new program with SUNY Oneonta to test and monitor water quality on Lake Atitlan. Once we can accurately prioritize which stressors on the lake should be addressed first, ATC will work with partners to design a solution. 12. We started our “Mayan Power and Light” program where we teach Circuits and Solar to young Mayan women and help them start a solar power cooperative. Mayan Power and Light, solar power to replace kerosene lamps and international volunteer travel experiences will be our focus for 2013. We are very excited about 2013, Mayan Power and Light and volunteer travel opportunities in Guatemala and Nicaragua. Mayan Power and Light – By the Numbers - Based on our experience and that of our collaborative partners the women's solar power cooperative will sell about 1,000 small scale solar home lighting systems to people who don't have electricity. Each house will save 750 pounds of CO2 per year. ATC will also train 8 - 10 other groups to teach Circuits and Solar and start solar power micro businesses in other less economically developed countries. About half of these groups will start successful solar power businesses who will sell about 1,000 solar home lighting systems around the world. That makes 5 businesses started the first year. We plan on repeating this program every year for 5 years. Some businesses will drop out and some will expand. At the end of 5 years there may be 25 solar power businesses selling 1,000 solar home energy systems per year saving 18,750,000 pounds of CO2 every year. Your support of Mayan Power and Light will go a long way to improving the quality of life for some of the world's poorest people while at the same time saving thousands of tons of carbon dioxide from our atmosphere. A win-win situation if ever there was one. We are pleased to offer the opportunity to work on solar power, natural building techniques and to learn about solar power in Guatemala in 2013. 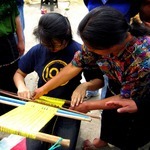 In addition to several student travel projects we have opportunities for everyone to work with us in Guatemala. Come join The Appropriate Technology Collaborative for the experience of a lifetime. This trip will focus on installing solar power at a small school and learning natural building practices on Lake Atitlan in Guatemala. Recent participants report ATC volunteer work projects as “life changing” and “the best vacation we ever had”. (Note: we promise hard work but most people call it fun) While most tourists never experience Guatemala up close you will work hand-in-hand with local talent and gain insight into an indigenous American culture. Many local ATC staff speak the local languages Kachiquel and K’iche’. info@apptechdesign.org, please include in the subject line “Travel March 2013”. Guatemala is located in Central America. It borders the North Pacific Ocean, between El Salvador and Mexico, and the Caribbean Sea between Honduras and Belize. Guatemala is rich in natural beauty and travel opportunities; it's a country that offers much to those willing to step off the beaten track for a little while. Antigua Guatemala is often regarded as the traveler’s hub, a picture-perfect Central American town ringed by volcanoes. La Antigua is a great place to learn Guatemalan history or simply sip some coffee in a street-side cafe and watch the world go by. 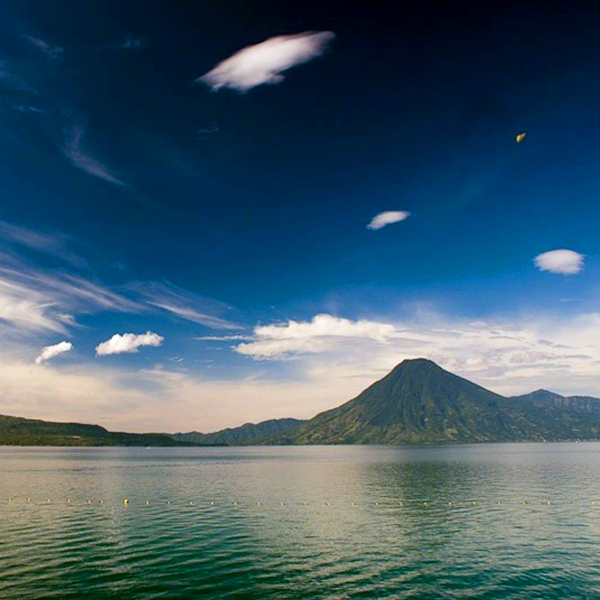 Lake Atitlan (or Lago de Atitlán) where our project is located is another frequent stop on any visitor’s itinerary. Lake Atitlan is a volcano-rimmed lake considered by many world travelers to be one of the most beautiful places on earth. Guatemala is small with an estimated population of 13 million. It hosts a tropical climate along the lower elevations and cooler weather in the mountains where our project is located. The country is full of rich indigenous culture and Spanish traditions. However, Guatemala also has a nearly 80 percent poverty rate. Day 1 March 9, 2013: Greeted at the airport by ATC Guatemala staff, shuttle to your hotel / hostel in Antigua. Day 2 (Sunday): AM, Breakfast then a walking tour of Antigua with local historian Elizabeth Bell or her staff; travel to Santa Cruz, Lake Atitlan; dinner at our hostel / hotel. Days 3-7 (Work days, Monday-Friday): Breakfast served at 8:00 AM before traveling by boat to work sites; work from 8 a.m.-4 p.m. with lunch on-site; free time after work to clean up; supper served family style; time for team activities, learning about solar power and free time. Day 8 (Saturday): Travel to Mayan Ruins at Iximche; travel to Antigua; free time; walking tour of the Antigua Market (optional) overnight in Antigua. Day 9 (Final day, Sunday March 17, 2013): Departure day. Note: Trip includes special events throughout the week, including cultural experiences visits to local NGOs, market tours, boat rides, etc.. All food and travel is covered in the Program Cost. Beverages other than coffee or tea at breakfast and safe drinking water all day are not covered in the Program. Hotels / Hostels include double- or triple-occupancy rooms and are simple and basic and typically located near the project site. Guatemala’s climate can be hot during the day and cool at night. Hot water is provided but, based on experience, will probably not work all of the time. Hotel rooms will be cleaned and maintained daily. Lake Atitlan is at an altitude over 5,000 feet so mosquitoes are rare. If you are staying in a Hostel room please check your valuables with ATC staff or the Hostel desk. Air travel to and from Guatemala is not provided. Payments to The Appropriate Technology Collaborative and for air travel associated with our work in Latin America are tax deductible per U.S. IRS Code. See IRS Publication 526. We recommend you contact a tax professional. The Appropriate Technology Collaborative is challenging travel volunteers to make an even greater impact on poverty. 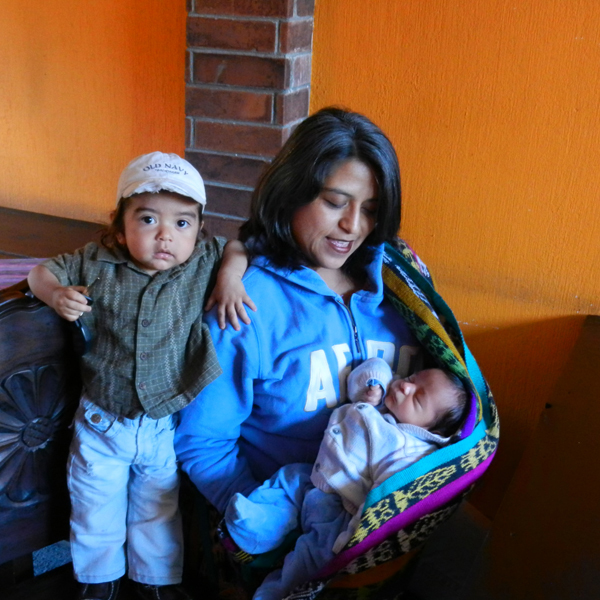 We are asking all ATC teams to help us raise an additional $10,000 in 2013 to support ATC’s projects in Latin America. Take the challenge – ask for details on the trip or contact us – info@apptechdesign.org, Subject “Travel Team Challenge”. The Appropriate Technology Collaborative designs, develops demonstrates and distributes new technologies that improve the quality of life for the world’s poorest people. We have several projects currently in development including low cost medical diagnostic tools, very low cost solar lighting, wind turbines made from local fabric and a solar coffee dryer! The Appropriate Technology Collaborative is a not for profit 501(c)(3) charitable organization. Your donations keep our programs going. Thank you! ROSA Fresh — How do they do it? from Stas Fomin on Vimeo. Change your mental attitude, and the world around you will change accordingly. Your world will become what you choose to make it. You can reach great heights of success, or you can settle for a miserable life that is devoid of hope. The choice is yours. When you choose a positive course, you set in motion an unstoppable force that will allow you to have a fulfilling career, the love of your family and friends, good physical and mental health, and all of the other true riches of life. To change your world, you must change it from the inside out. You must begin with yourself. When you choose the course that puts your life on a positive track, you will change your life for the better, and you will also positively influence the people with whom you come in contact. Detroit Future Celebration: A Community Reportback - YouTube: " "
A young son and his father were walking along a high mountain ridge in the middle of a long chain of mountains. Suddenly the boy trips and falls, hurting himself in the process. The boy reflexively let’s out a painful scream: AAAHHHHhhhhhhhhhhhhhhhhhhh!!!!!!!!!! To his complete surprise, he hears a voice repeating somewhere off in the distance of the mountains: AAAHHHHhhhhhhhhhhhhhhh!!!!!!! The boy is completely surprised, but still does not understand. Then the father explains: “People call this ECHO, but really this is LIFE my son. It will always give you back everything that you say or do. Our life is simply a reflection of our actions. If you want more love in the world, then create more love in your heart. If you want more competence on your team, then improve your own competence. This relationship applies to everything, in and out of sports, in all aspects of life. YOUR LIFE IS NOT A COINCIDENCE. IT’S A DIRECT REFLECTION OF YOU! How Can I Build a Quiet, Low-Powered Home File Server? Learn how grassroots organizers used $1.8 million in stimulus funds to seed a digital justice movement in Detroit. 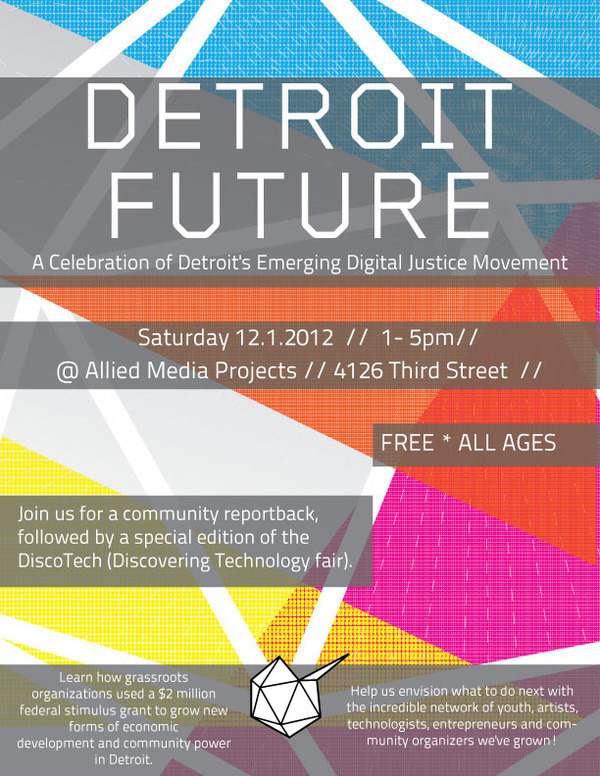 Join us for the Detroit Future Celebration! Saturday Dec. 1 from 1:00 - 5:00pm at the Allied Media Projects office, 4126 Third Street between Willis and Alexandrine. The event will kick-off with a community reportback and media showcase, followed by a special edition of the "DiscoTech" Discovering Technology Fair. More information below. Unlimited power may be available when two or more people coordinate their thoughts and actions in a spirit of perfect harmony for the attainment of a definite purpose. A Master Mind alliance involves two or more people working together in perfect harmony toward the attainment of a common purpose. Such a partnership creates a superpower that enables each of its members to do far more than either would have been able to achieve separately. Choose your Master Mind partners carefully. Align yourself with people whose strengths complement yours. If you are a right brain person, for example, a logically-driven left brain person may be a perfect counterbalance to your creative bent. Above all, choose to associate only with people who share your positive values and your commitment to similar levels of achievement. Let Detroit Future Media 2013 begin! This will be the third round of Detroit Future Media. In this cycle, our goal is to deepen the relationships and skills that have grown through the Detroit Future networks over the past two years. Participants will receive an orientation to media-based community organizing and then apply to one of four focus areas: Education, Entrepreneurship, Transformative Art Practices, or Digital Stewardship. We are also excited to introduce five new workshops and instructors to the curriculum: Audio Podcasting, Beatmaking, Wearable Electronics, Digital Photography, and 3D Video! Participants will be required to complete a media-based organizing project of their choice, that works towards their vision for the future of Detroit. These projects will blend knowledge and skills learned in the focus area classes with media workshops. To learn more about this year’s program click here. There will be an info session on Tuesday, November 20, 2012 from 6:00-8:00PM at Allied Media Projects, 4126 3rd St, Detroit, MI. We encourage all DFM alumni and everyone in the DDJC network to attend to learn more about the upcoming year, to find project collaborators and to see Detroit Future friends. Please click here to RSVP. The Detroit Future Media Workshops are made possible through the Ford Foundation and a grant awarded to the Detroit Digital Justice Coalition (DDJC) by the Broadband Technology Opportunity Program of the American Recovery And Reinvestment (Stimulus) Act. The Detroit Digital Justice Coalition is comprised of people and organizations in Detroit who believe that communication is a fundamental human right. We are securing that right through activities that are grounded in the digital justice principles of: access, participation, common ownership, and healthy communities. Faith is the head chemist of the mind. When faith is blended with thought, the subconscious mind instantly picks up the vibration, translates it into its spiritual equivalent, and transmits it to Infinite Intelligence, as in the case of prayer. You will never be greater than the thoughts that dominate your mind. If it’s true that you become what you think about most, it follows that the quantity and quality of success you achieve in your life will be in direct proportion to the size of your thoughts. If you allow your mind to be dominated by trivial matters, your achievements are likely to be unimportant. Discipline yourself to think about important things. Keep up with what’s new in your field and with what’s going on in the world. Make a list of good ideas that you can use anytime you are searching for a creative solution to a problem. Remember, small minds think about things; great minds think about ideas. Beware of him who tries to poison your mind against another under the pretense of helping you. The chances are a thousand to one he is trying to help himself. South African poet and painter Breyten Breytenback tells of a black man named Freedom who was the property of a one-legged slave owner in the days before the abolition of slavery. Whenever the owner bought a new pair of shoes, he gave the left one, which he couldn’t use, to Freedom. Eventually, wearing two left shoes deformed Freedom’s right foot, and he was permanently crippled by the “generosity” of his master. Don’t be fooled by people who attempt to further their own interests under the guise of helping you. Listen to advice from others, thank them for their interest, and make up your own mind about what is best. Follow their advice if it fits with your plan for your life, but don’t hesitate to discard it if it doesn’t. In all the world, there is only one individual who knows what is best for you, and that person is you. Join New Horizons for our Free 7th Annual Technology Event! New Horizons is pleased to have the following partners involved with this year's Techknowledgey event: Microsoft, C/D/H, VDS, Rightpoint, Project Leadership Associates, Virtual Savant, Automation Alley, The Coil Group, MobileComply, Good Technology and more. Attend the Techknowledgey event to network with participants and partners, enjoy lunch on us, and enter to win great prizes! Seating is limited, so please register today! Contact your Account Executive at 734-525-1501 or sales.detroit@newhorizons.com to learn more and to be added to our contact list to ensure you receive all event updates.